One of my favorite foodie travel destinations in the world is certainly Spain. Kevin and I visited the country back in 2010, and I fell in love with the tapas, food markets, and the almost addicting jamón Iberico de bellota. 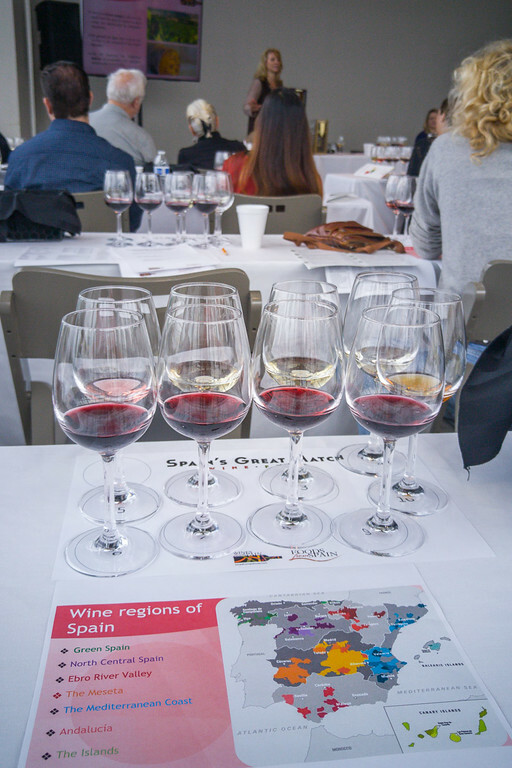 Last night I got to relive some of those culinary memories at Spain’s Great Match, a wine and food expo in San Francisco featuring more than 200 products imported from Spain. 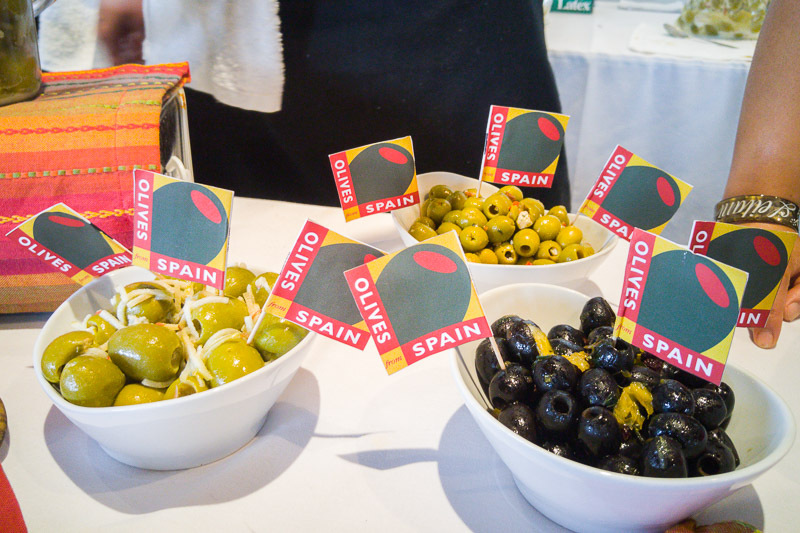 I went to the event as a guest of Olives from Spain, to learn how to use Spanish olives but I got to try dozens of other Spanish wine and food pairings. For more than 2,000 years, farmers have been growing olives and producing olive oil in Spain. The country is the world’s biggest producer of table olives and exports 40% of all the olives in the world. There are 300 million olive trees in Spain, stretching across two-thirds of the country’s arid southern, central, and eastern regions. There are three main varieties of Spanish olives that are sold in the US: black ripe olives, small green Manzanilla olives, and large meaty Queen olives. If you’ve ever eaten those little green pimiento stuffed olives they very likely came from Spain. I love all kinds of olives and regularly slice them and put them in salads and sandwiches, but I never really thought about marinading with other flavors them at home to make them into an appetizer of their own. 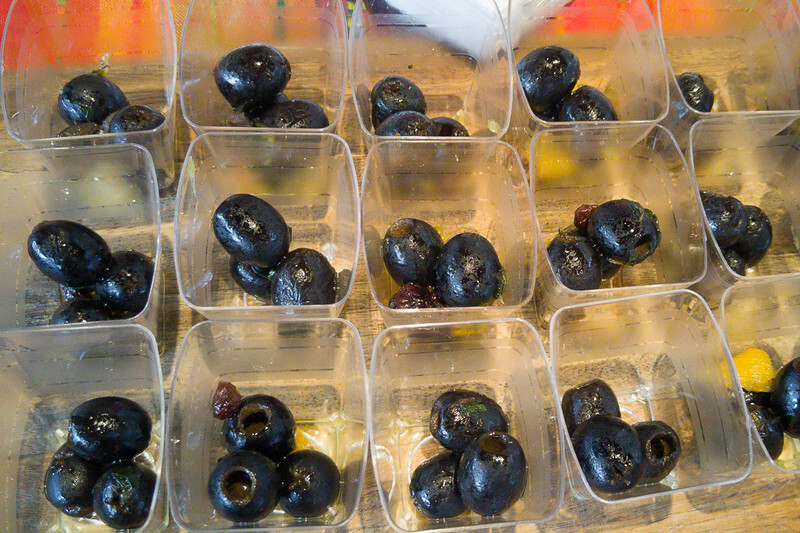 The Olives from Spain booth shared some simple and unique ways to serve olives as tapas that I would love to make for a party or tasting event. Combine black olives with diced oranges, dried currants, diced mint leaves, a splash of orange juice, and a bit of extra virgin olive oil. Mix jumbo Queen olives with crumbled goat cheese, diced apple, honey, and a splash of olive oil. Mix green Manzanilla olives with slices of roasted red peppers, crumbled blue cheese, shaved Marcona almonds, honey, and a splash of extra virgin olive oil. 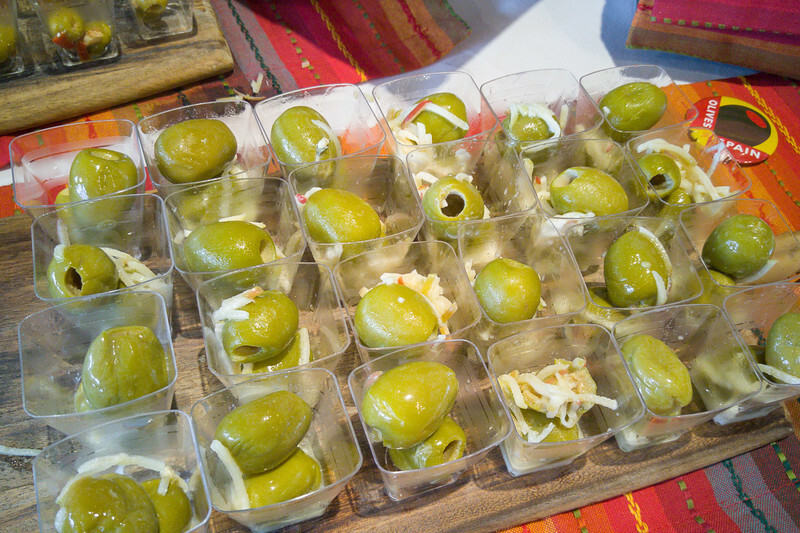 Beyond the olive tasting, I stopped by several other booths to try different Spanish products. 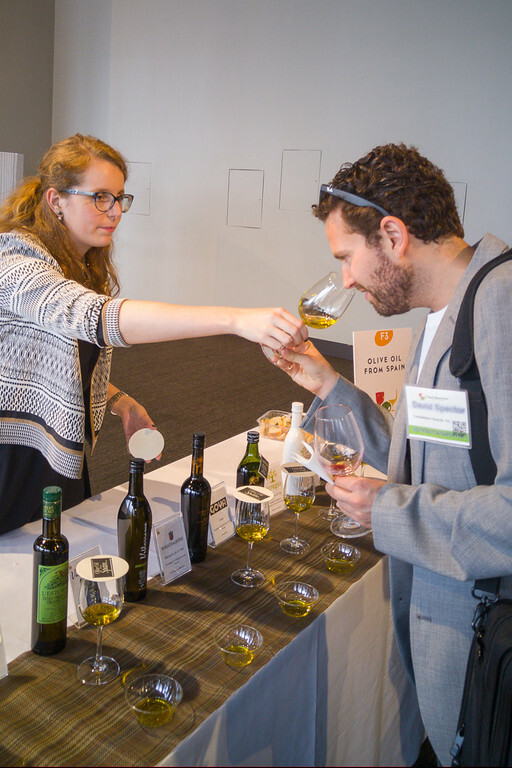 At the olive oil tasting booth I sample several varieties of olive oils from Spain. From my past olive oil tasting adventures, I knew that I like really pungent and peppery olive oils and so I was a fan of the oils made from picqual and hojiblanca olives, that tend to have those flavors. 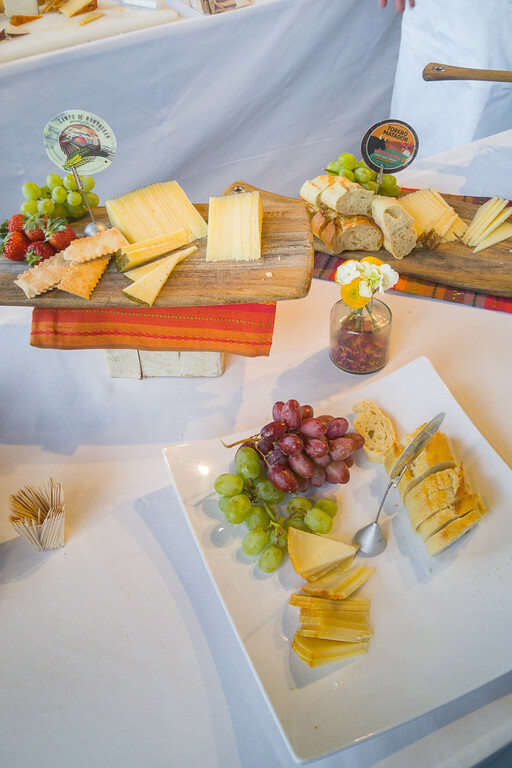 I stuffed myself on a variety of Spanish cheeses served by Farmstead Cheeses & Wines, a local cheese shop with locations in Oakland and Montclair. 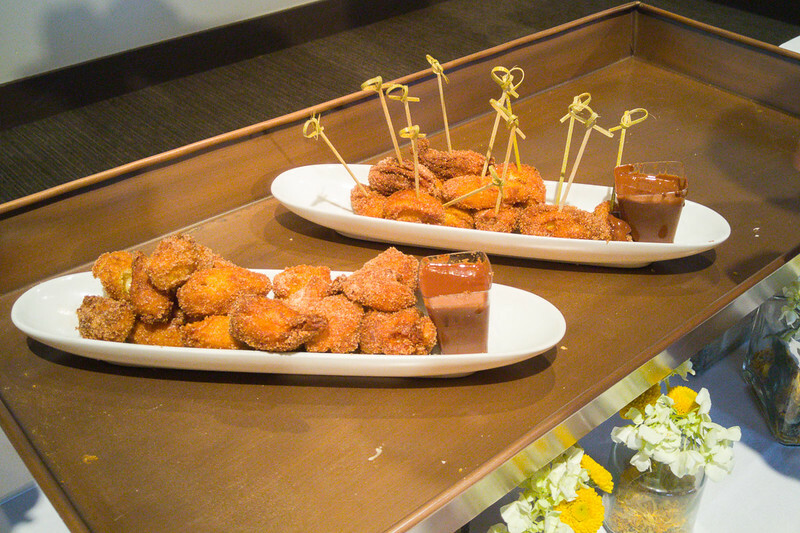 and churros and chocolate made by Canela Bistro & Wine Bar (2272 Market St, San Francisco). At the last minute, I was lucky to grab a seat in a Spanish wine-tasting workshop led by Leslie Sbrocco, local wine educator and host of KQED’s, “Check Please Bay Area.” In this workshop, we learned about the major wine producing regions of Spain and sampled wine varietals characteristic of each region, from bold, oaky reds from the Rioja region to (my new favorite!) crisp Albariño white wines from Galicia, and Spain’s Northern Coast. One of the guest speakers at the workshop was the head sommelier from Bellota (888 Brannan St, San Francisco) and he shared his fabulously nerdy wine list — all Spanish wines, organized geographically, by region of the country. I’ve added this restaurant to my local foodie wish list! It was a great event that has me itching to go back to Spain. In the meantime, I now have some new ways to bring the flavors of Spain home with me. This is a sponsored post, written in partnership with Olives From Spain. All photos and opinions are my own. 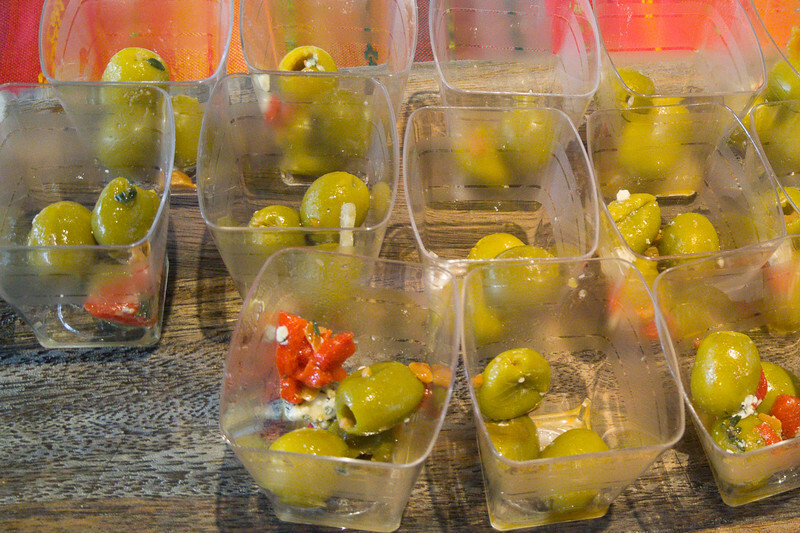 Looking for things to do with olives? Check out the Olives From Spain website for more recipes and ideas.